GamerDad: Gaming with Children » Overwatch Cereal?!? No this is not an April Fools’ joke, this stuff actually exists. You can get it in stores now, so I thought I’d write about it here. You’ll have to forgive me, I don’t know a whole lot about Overwatch, so my description of the cereal may not be as detailed as it was when I reviewed the Super Mario Cereal a year or so ago. I know about some of the Overwatch characters. I know there’s one named Tracer and one who has pink hair, and I think there’s a gorilla. But while the characters are pretty interesting, the gameplay just isn’t my cup of tea. 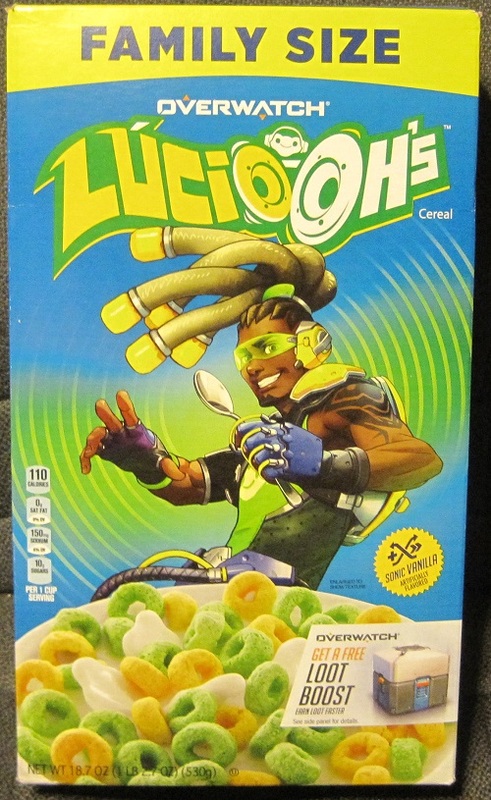 The character featured on the Overwatch cereal is Lucio. I don’t know who that is or how popular he is or why he’s on the box. But I guess Lucio-Oh’s sounded better than Tracer-O’s. I’m going to guess that Lucio is some kind of DJ? Anyway, here’s a bigger picture of the front of the box. 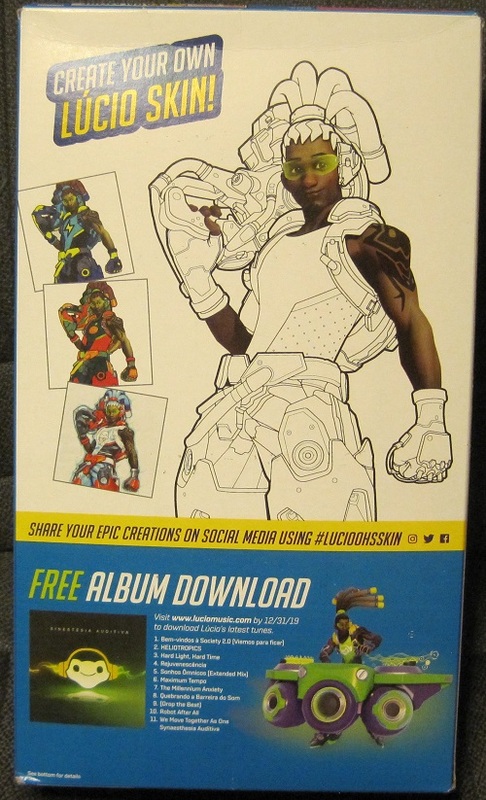 On the back of the box you can color in Lucio’s clothes to make your own ‘skin.’ And there’s also instructions on downloading some of Lucio’s songs. Here’s a bigger picture of the back of the bot. The side of the box gives you instructions on how to get your free Loot Box for the Overwatch game. Just make sure you save your receipt from when you bought the cereal at the grocery store, as you’ll need it! I think it’s funny that they put the game rating on the side of the box, too. Makes it look like the cereal is rated T for Teen. Remember when cereals had actual prizes in the boxes? I miss those days. And here’s what the cereal looks like in a bowl with milk. Mmmm, mmmm, doesn’t that look appetizing? I’m not sure why it’s green and yellow and what that has to do with Overwatch, but at least it doesn’t have any marshmallows! It kind of tastes like Froot Loops, except not as good. 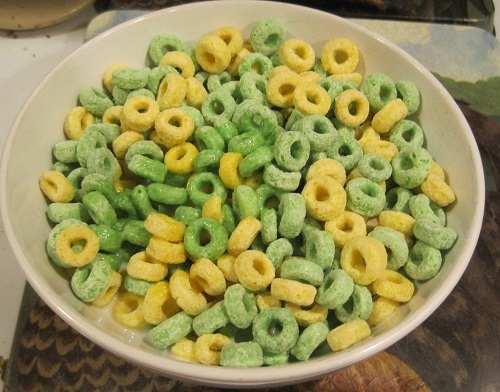 Or maybe I just don’t remember exactly what Froot Loops taste like, it’s been a while. You know, when we’re all living on Mars, this is what we’ll be eating in before a holodeck match of Overwatch Holo.